Sharda University Alumni Association, in association with Sharda Hospital, came up with Sharda Half Marathon 2018. It took place on 18th Feb, 6:30 AM. To begin with, the origin point was lush green 63-acre spread Sharda University campus and the theme of the race was ‘Run for Health, Happiness & Unity’. Eventually, after the grand completion of Sharda Taj-Marathon 2016, Sharda Half Marathon- 2018 set the new records of success and flamboyance. In fact, it was the largest road-running event in Greater Noida. Sunita Godara, the flying fairy of Indian Marathon, was the ambassador of Sharda Half Marathon 2018. In the year 1984, she won the first national marathon championship in Delhi. In addition, she has two medals in Penang and Kedah as a feather to her glory cap. Also, she has a gold medal in Asian Marathon Championship at Bandung in 1992. The presence of such a legend is sure to boost the morale of participants. Cool dawn of 18th Feb was really pleasing in the university campus. The hoards of runners, after beating the sun, started gathering well-before the time. Also, the athletes were in the cool marathon T-Shirts and cap with BIB number on their chest. They were all set to defeat the distances in different race categories- Pink Marathon (3 Km), Green Marathon (5 km), Mini Marathon (10 Km), and Half Marathon (21 km). The flag off the stage of the marathon was adorned with the cultural programmes performed by the students of Sharda University. Chancellor Sir Shri P.K. Gupta Ji, pro-chancellor sir Shri Y.K. Gupta Ji, and brand ambassador Sunita Godara Ji encouraged the runners with their motivational words and flagged off the races of different categories. On the different routes, there were energy stations to reenergize the body of all the runners in no time. The ambulances, security staff, police, and our cameramen followed the marathoners everywhere on the route. Efforts of the organizing committee for such a management of thousands of participants were really appreciable. The delectable taste of nutritious breakfast, was there, after race completion, bids a mention here. All the participants enjoyed the lip-smacking refreshment after reaching the endpoint. Then there was an announcement for the distribution of race completion certificates and prizes in different categories. The stage for prize distribution ceremony was packed with the presence of celebrities like Sunita Godara Ji, Jaspal Rana Ji, and the dignitaries of Sharda University & Sharda Hospital. Winners and 1st & 2nd runner-ups of all the categories were awarded medals and prize money. Electronic as well as print media made this event talk of the town on Sunday. 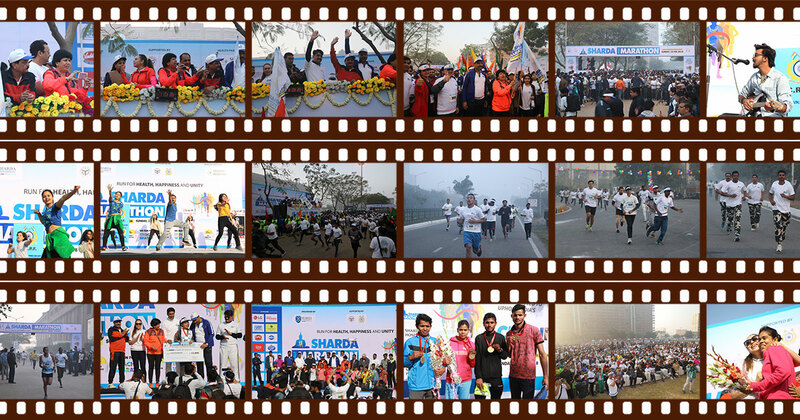 Sharda Half Marathon wrapped-up as the largest road-running event in Greater Noida.